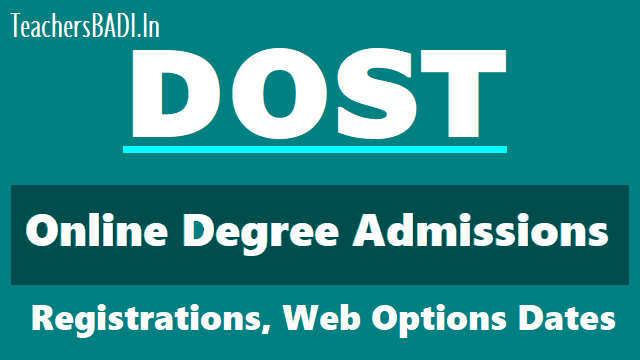 DOST Online Degree admissions final phase Web options dates /schedule 2018; DOST Online Degree admissions 1st,2nd,3rd phase Web options dates/schedule 2018/ TS #DOST Online Degree Admissions Web Options Schedule/Dates 2018, #DOST-Degree Online Services Telangana,TS Online Degree Admissions 2018 Schedule notification, Apply online for degree admissions in Telangana Universities @ dost.cgg.gov.in: Osmania, Kakatiya, Telangana, Mahatma Gandhi, Satavahana and Palamuru Universities have issued the Online Degree Courses/Under Graduation(UG) Courses admission notification and Online application forms are invited from the eligible students through online mode for registration and admissions into various ug/under graduate courses, such as B.A., B.Com., B.Sc., B.B.A., B.C.A., etc., offered by various colleges affiliated to all Universities in Telangana, which includes Constituent, Government, Aided, Autonomous and Private Colleges for the academic year 2018-2019. డిగ్రీ ప్రవేశాల్లో ప్రత్యేక రిజిస్ట్రేషన్లకు దోస్త్ షెడ్యూల్‌ను ప్రకటించింది. 14.08.2018 to 16.08.2018 వరకు దోస్త్ ప్రత్యేక విడత రిజిస్ట్రేషన్లును చేపట్టనుంది. 14.08.2018 to 16.08.2018 వరకు వెబ్ ఆప్షన్ల నమోదుకు అవకాశం కల్పించింది. 17.08.2018న డిగ్రీ ప్రత్యేక విడుత సీట్ల కేటాయింపును వెల్లడించనుంది. Admission Schedule of DOST 2018-19. DOST News: Colleges can access their College and course wise seat allotments from ccets.cgg.gov.in. The third phase of web options would be announced from June 20 to 25 while the second phase of seat allotment would be done on June 30. Students should report to their respective colleges from July 2 to 4. 2. If not received, Use Allotment Confirmation OTP Service on the DOST Web Site. This OTP will be valid till 20 June midnight 12PM. The 1st, 2nd, 3rd phase of counseling for Admission in Degree will be held from above mentioned dates... New students have suggested to get their Aadhaar Card, Biometric Authentication, Registration in helpline centers at these service centers. From above dates, online web options and allotment of seats on above date and those who have seats will be required to report to their respective colleges from above dates. As per its schedule, the final phase of web options will be available and students from above mentioned dates will have to report to the allotted colleges. Intermediate Advanced Supplementary Examination appeared candidates are suggested to apply for degree online courses so far. The Degree Online Services, Telangana (DOST) has announced that the last date to register for the final phase of the allotment on see above mentioned dates. Candidates who wish to appear for the exam can apply for the same from the official website. “Students who have registered already in Phase-I or II or III can directly access web options for participating in Final Phase,” an official notification said, adding that students who have participated in the previous rounds need not fill the application forms and will be required to pay Rs 400. The seat allotment process will take place on (see above mentioned dates) and candidates who have been allotted seats in this round will be required to report to their respective colleges/institutes from (see above mentioned dates). Final phase of counseling for Admission in Degree will be held from (see above mentioned dates). The counselling process will continue for a week. Phase final Schedule Announced. All the Students who are registered already or who are not confirmed in the previous phases are also eligible. Use your web options carefully. If allotted in Phase final, You will lose your seat confirmed in the previous phases. Candidates in the list published are only allowed for registration. Please check your name before you reach HLCs. Phase-III Schedule Announced. All the Students who have registered already or not confirmed in the previous phases are also eligible. Use your web options carefully. If allotted in Phase final, You will lose your seat confirmed in the previous phases.. Step 1: Go to the official website for Telangana DOST (dost.cgg.gov.in). Step 2: Follow the links provided to apply. Step 3: Fill in your details in the fields provided and submit your application. Step 4: Download your allotment application and keep a copy for further reference.